Today, ‘ben-a-ball‘ is a collection of things, but predominantly, it’s a blog. But once upon a time it was who I was and what I did. Instead of forgetting about it, I keep it around, as a reminder of where I’ve come from. “Ben-A-Ball” originated back when I was, from what I can gather, about Grade 2. It was essentially a school club, a playground roleplay and strangely enough a card game… these things didn’t combine into one though, they were like separate franchises licensed under the same corporation. (Though realistically it wasn’t that complicated.) As much as it was a roleplaying imagination game that would involve my friends and I running around pretending that we were fending off evil using all sorts of spy gadgets and powers, it was also a name. Many projects made during the time took on the name as though it were a brand. It also was used as my nickname for quite some time as well. Because of this it was often used on my work in place of ‘Ben Nelan’ – an example would be the series of comic books named ‘Super-D’ – which proudly featured the words “MADE BY BEN-A-BALL” on the front cover. These comic books also carried another insignia: ‘1000 Games Productions.’ – which was another sort of logo or company that was solely used on comic books alone. The logo itself first came to be on the backs of Ben-A-Ball Trading Cards. I have a vague memory of drawing these cards while sitting on the floor of my hallway. It’s possible that the name ‘Ben-A-Ball’ was actually created originally with the purpose of it being the name of the card game. Although I’m not entirely certain of this – I feel pretty sure that’s what happened, you’ll know why in a moment. These trading cards became a collaborative effort between my classmates and I. As you can see in this image – I have a few books just filled with these hand-drawn paper cards. The more perceptive of you may have also noticed how much my handwriting hasn’t improved over the years… but hopefully you also noticed how much these trading ‘papers’ seem to take on the layout of Pokémon or Yu-Gi-Oh cards which were incredibly popular at the time. Because of the popularity of these trading cards in the playground, it makes some kind of sense that imaginative kids would want to make their own. Before we continue on with ‘A Lesson in Ben-A-Ball History’ I also ask you to notice the hyphens in the name ‘Yu-Gi-Oh’ and the fact that in Pokémon there are ‘Pokéballs.’ When I look back on this sort of stuff I can’t help but smile. Following my childhood mind through the shameless imagining of the name is quite hilarious. Details are of course quite foggy, so I can’t remember if this exactly the line of thought I had when I came to create the name ‘Ben-A-Ball’ – but come on… sadly these connections seem highly likely. As I said before, Ben-A-Ball was used as a nickname, a sort of brand – and like I said before, a sort of primary school franchise that included role play, games, stories, comic books and the trading cards. Funnily enough, there was also a competitor called ‘BrentStar’ that did a lot of the same things. It was truly an odd sort of childhood creation with a lot of business-like elements to it. I look back at it now and wonder how on Earth it even held together as long as it did. As time progresses it seems more and more strange – but also comforting to some degree. Life is one of those things that starts off feeling so unchangeable. It’s a stable ground of family members and a time without worry. Piece by piece that all gets taken away until you’re no longer that child living in an invincible dream land. For me, the first piece to fall was a big one. The instability of my world was revealed when the first chunk fell from its place. My grandfather passed away. Now, the name is like a memory wormhole connecting me back to before the pieces of fantasy began to fall. Just by thinking about “Ben-A-Ball” I can recollect to a time of pure imagination dipped in a thick layer of naivety. Through time these events have become mystical in my mind. 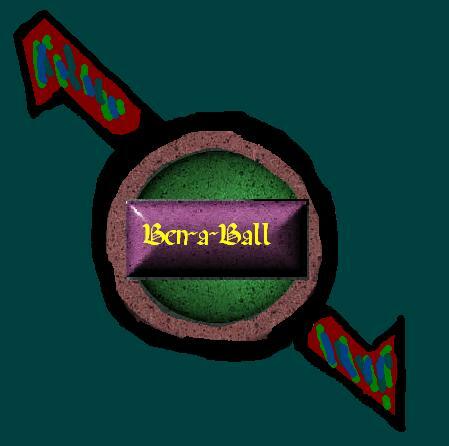 So to end this up, I use ‘Ben-A-Ball’ on my website because it takes me back. It reminds me of who I should never become, to never stop thinking, to never give up on the make-believe and to never change your morals in order to fit in. But most of all, apart from making me sound bats**t crazy… it tells me to imagine.